After years of uncomfortable silence, the nation’s political discourse is now full of, if not dominated by, discussions of the crisis created by the national debt. This is long overdue as the seeds were planted for this over decades. 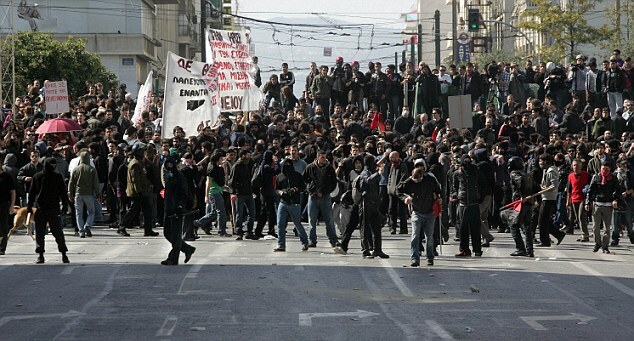 Headlining the news today is the social unrest created in Greece as they have finally reached the edge of the financial cliff and faced with the prospect of going over that rim, are trying to find a solution which apportions the pain across the population. It is easy for American commentators to dismiss the situation in Greece as a flawed comparison which could never happen in the United States. Indeed Greece is a small country with a population of just 11.3 million, as part of the euro zone it had limited monetary control and is not considered a strong economy. The United States is still the largest economy in the world, both in nominal terms, but also more importantly on a per capita basis among the major economies and among the most diverse economies in the world. The US Dollar is the international reserve currency and considered the safest in the world; the one international investors seek in times of financial and political risk. Most importantly the Greek debt has passed 125 percent of GDP while the US is at a much more manageable 75 percent. While all this is true, it overlooks some of the challenges we face in the US in resolving the debt crisis, the liabilities within the social Security System which are not counted in the national debt calculation and the potentially devastating effect of an international exodus from the US dollar if investors lost faith in our ability to manage our finances. What the Greek situation today does illustrate is the significant social strains which will be places on American society in the event we do not find a long term solution to our fiscal situation. Somewhere around 2026, just 15 years from now, the majority of Americans who as of now depend on Social Security for a majority of their retirement will get a shock when their benefits are cut by 30 to 40 percent when the Social Security runs out of money. The social implications of this should be alarming to policy makers as it will place at risk the basic structure of American society. On one hand we will potentially have a massive displacement of older Americans, many of whom will be facing homelessness or massive restrictions of basic needs of life which we as a people have found to be unacceptable. On the other hand there will only be between 2.0 and 2.5 workers in the workplace to support each of those then receiving benefits and any tax increase to support those receiving benefits could easily double their total effective tax bill, a situation which would be socially, let alone politically unacceptable. The massive cuts in all spending and unavoidable tax increases would likely send Americans to the street. Back in 1985 Ronald Reagan’s commission on Social Security proposed relatively modest adjustments to the cost of living increases in Social Security, many of which simply better reflected the actual cost of living for seniors, as well as a gradual increase in the retirement age. This represents the inevitable truth of Social Security, when created you received benefits at 65 when life expectancy was just 62. Then Senate Majority leader Bob Dole courageously endorsed the commission’s recommendations and as a result saw the Republican majority reduced to a minority in the 1986 midterm elections as the Democratic demagogues portrayed it as forcing seniors to eat cat food. Thus the myth of Social Security being the “third rail” of American politics was born, a myth reconfirmed in 2005 when President Bush half heartedly attempted to allow private investment and management of social security. Policy makers today can only wish they had options as painless as those Bob Dole chose to champion. At its core, the federal budget deficit is a reflection of the fight for America’s self identity in the coming decades. President Obama is in fact a social-democrat, progressive, socialist or whatever you want to label those who seek a dramatically expanded a European style role for government. If you choose to support this view it is impossible not to dramatically increase taxes to pay for those services. This will also result in a change in the nature of American society to one where government replaces the entrepreneurial private sector as the leader of society. Those of us who believe that government’s role should be limited to national and domestic security and providing only a social safety net enough to ensure our citizens are not neglected must recognize the time has arrived to stop the inertia of government spending. This means revitalizing the private sector and true capitalism. We must restore the concept of moral hazard to the private sector: if your business is not successful and well managed then it should fail to be replaced by those who can. We must stimulate the private sector not with shovel ready dreams but with tax cuts to spur investment (a dramatic acceleration of capital depreciation on new investments as an example), reductions in government regulations and eliminating regulatory activists such as the NLRB (if Boeing wants to build a factory in South Carolina, it is no concern of the federal government, period). And raising the debt ceiling should be done to a reasonable ceiling, then prevented from increasing the next time we fail to live within our means. The riots in the streets of Greece should be seen as a somewhat blurred and distorted by the filter of time look into our future if we stay on our current track. Over the past few years I have resisted supporting some of the more emotional movements calling for reductions in government. I believe we as Republicans must present a free market alternative to Obamacare rather than simply call for repeal. The responsibility of governing calls for the adoption of real solutions not just opposing the socialist programs of the left. We must show true fiscal stewardship of all elements of government spending such as defense (the elimination of programs even the Generals don’t want like the F136 “alternative” engine for the F 35). Every American must embrace less government spending even in their home town, not just the rest of the country. This will not be a one program Silver bullet but rather a line item by line item review of spending. While I truly fear the empty rhetoric we hear from all sides in Washington today, I have tremendous faith in the American people. When challenged the people have always faced sacrifice and restraint with strength and resolve. What is needed is the courage of leadership to make the case to the people those real solutions exist and a path to stability is defined. What we need is detailed reforms, not empty rhetoric; what we need are real leaders, not blow hards and demagogues. It truly is time to man up.